The 32-acre mini-metropolis seeks to replicate modern urban chaos with traffic jams and unpredictable pedestrians, alongside suburban streetscapes, superhighways and rural roads. DETROIT (Bloomberg) -- A simulated city opened Monday on the north campus of the University of Michigan to test how self-driving cars will travel in the future without mowing down pedestrians or causing colossal crashes. Automakers are racing to develop self-driving cars and overhaul their business models for a world where mobility is being redefined as most of the global population crowds into large megacities during the next two decades. Driverless cars that move in harmony may become essential to keep people and goods flowing safely and efficiently. M City, a 32-acre mini-metropolis, seeks to replicate modern urban chaos with traffic jams and unpredictable pedestrians, alongside suburban streetscapes, superhighways and rural roads. The $6.5 million facility in Ann Arbor, Mich., has 40 building facades, angled intersections, a traffic circle, a bridge, a tunnel, gravel roads and plenty of obstructed views. There’s even a four-lane highway with entrance and exit ramps. Sebastian, a mechatronic pedestrian, will step out into traffic to test whether the robot cars will sense him and hit the brakes to avoid running him down, Sweatman said. Sweatman is also director of the Mobility Transformation Center, formed by academic, government and corporate sponsors, including General Motors Co., Ford Motor Co., Toyota Motor Corp., Nissan Motor Co. and Honda Motor Co.
Automakers have said driverless cars may be on the road within five years. The market for autonomous technology will grow to $42 billion by 2025 and self-driving cars may account for a quarter of global auto sales by 2035, according to Boston Consulting Group. By 2017, semi-autonomous cars that operate in auto-pilot mode, park themselves and change lanes automatically will be available in “large numbers,” the firm said. Ford has already tested a driverless Fusion hybrid sedan in M City and computer mapped all the streets and structures. The automakers will prove out their own technology on the course, but they are jointly researching issues like legal liability and how robot cars will make ethical decisions when confronted with a crash, said Greg Stevens, global manager of Ford’s driver assistance and active safety research. Until now, tests of autonomous cars have been conducted on public roads or private proving grounds. 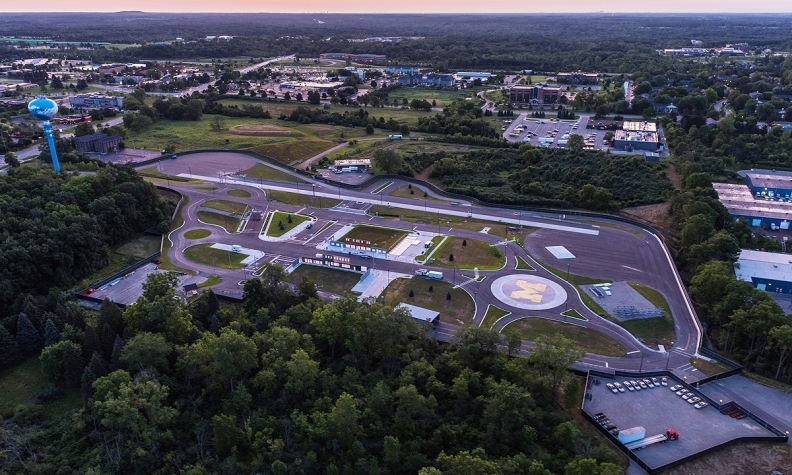 Automakers study robot cars on old test tracks designed to evaluate how fast traditional cars can run laps or how well they handle with humans at the wheel. Google Inc. has logged more than 1 million miles of testing its self-driving cars on Silicon Valley roads and, as of last month, Austin, Texas, highways. M City represents an alternative to that. Once a technology is proved in M City’s controlled environment, it can be tested on public roads, he said. Automakers and the university already have 3,000 connected cars on the roads in Ann Arbor, capable of communicating with one another and with infrastructure such as traffic lights. By 2020, there will be 29,000 connected cars tested on public roads in southeastern Michigan, Sweatman said. Automakers have been eager to take to the roads of M City, Sweatman said.